Amid sharply rising tensions between Washington and Caracas, the U.S.-backed opposition here sought on Wednesday to fill the streets with protesters and spark the beginning of a sustained uprising aimed at ousting President Nicolás Maduro from office. Overnight, the smaller-scale protests that began on Monday began to spread, with a throng of demonstrators in Bolivar state setting alight a statue of Hugo Chávez, the leftist firebrand who established Venezuela’s socialist state and anointed Maduro as his successor before dying of cancer in 2013. By early Wednesday, at least one protester was reported dead. The actions against Maduro took place as U.S. officials sought to fan the flames against Maduro. In a video, Vice President Mike Pence on Tuesday called Maduro a “dictator with no legitimate claim to power” and backed the opposition protests as “a call for freedom.” Coming on the heels of a series of U.S. sanctions, the move prompted Maduro late Tuesday to order a “revision” of diplomatic ties with the United States. The freshly re-energized Venezuelan opposition, meanwhile, faced a vital test on Wednesday in its effort to unseat Maduro, who was sworn in this month for a new six-year term after elections that were internationally condemned as a fraudulent power grab. Washington has already thrown its support behind the new leader of the opposition, Juan Guaidó, a 35-year-old industrial engineer who heads the country’s National Assembly. Stripped of its power by Maduro in 2017, the assembly is nevertheless widely recognized internationally as the only democratic institution left in the country. Now, Guaidó is seeking to unite an opposition long plagued by mismanagement and infighting and ignite the largest wave of protests here since 2017, when hundreds of thousands took the streets. That movement was ultimately squashed after official repression led to the deaths of more than 100 people. Turnout will probably influence the momentum of the opposition and gauge whether it has been truly reborn with new leadership and growing international support. “The silence with which the year started will become a roar of freedom, democracy and strength without precedent,” Guaidó declared on Tuesday. Backed by Russia, China and Cuba, Maduro has ordered the arrest, torture and exile of scores of opposition politicians. One day after Maduro’s swearing-in, however, Guaidó openly challenged his rule, saying he would be willing to become interim president if he won the support of the military, foreign powers and the people. Since then, thousands of desperate Venezuelans confronting record levels of hyperinflation and fast-spreading hunger and disease have been showing up in cities across the nation to hear Guaidó’s speeches. “Only if the protests are massive and cross-class could they demoralize and give pause to people in the military and within the ruling party,” said David Smilde, Venezuela expert and sociology professor at Tulane University. The military’s loyalty remains key to Maduro’s survival. 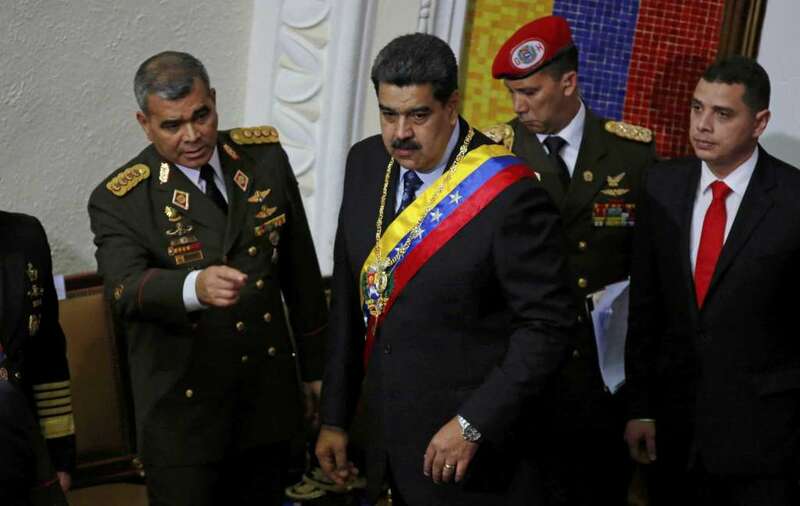 A U.S. intelligence official told The Washington Post this month that Maduro’s defense minister, Vladimir Padrino López, has privately told Maduro that he should step aside. And thousands of police and military rank and file have deserted their posts. But outward signs of division within the military have been limited. Nevertheless, there are growing indications of cracks. On Monday, dozens of Venezuelan National Guard personnel stole arms from two Caracas units, kidnapped four officials, and recorded themselves in a northern slum urging people to join them in rebellion. The videos circled social media but shortly after, the government announced that 27 dissenting officials had been arrested. That same day, hundreds of residents took to the streets as protests burst out in western slums across Caracas in the afternoon, continuing well beyond midnight. On Tuesday night, spontaneous protests also erupted in more than 60 neighborhoods across the capital and in interior states, many of them repressed by security forces with tear gas bombs and rubber bullets. In the state of Bolivar, protesters burned the statue of late leader Chavez, with footage of the incident going viral on social media. In a western Caracas slum, one 16-year-old was reported dead after receiving a gun shot at a demonstration, according to exiled lawmaker and doctor Jose Manuel Olivares, who received the information from the hospital the boy was taken into. The turnout is also likely to be closely watched in the United States and other nations that have been pressing for Maduro’s ouster. Colombia, Brazil and Chile have already jointed the United States in offering support for Guaidó and refusing to recognize Maduro. Luis Almagro, head of the Organization of American States, has gone as far as recognizing Guaidó as Venezuela’s “interim president” – a title not even Guaidó has yet claimed. On Tuesday, the National Assembly named a “special representative” to the OAS. If the organization accepts the new appointment, it could further undermine Maduro’s ability to represent Venezuela internationally. “Mr. Maduro has exacerbated the country’s corruption and socialist policies, accelerating its descent from one of the richest countries in the Western Hemisphere to one of the poorest and most despotic,” Pence said. Maduro threatened to respond by reassessing U.S. ties, though experts say it would be a risky for his government to wholly sever diplomatic relations. Such a move could prompt the Trump administration to freeze Venezuelan government accounts and institute its ‘nuclear option” against Maduro: an oil embargo that would cut off petroleum-producing Venezuela from its single biggest cash market, the United States. Yet taking such a radical step could also help Maduro mobilize Venezuelans against a common enemy to the north. As Venezuelans weighed whether to join the protests, many feared the pro-government security forces would deploy the same kind of violence now as they did in 2017. For many, that was too high a cost, especially after the opposition became ineffectual in the months that followed. Yet Guaidó, who was briefly detained by the intelligence police on Jan. 14, has brought a new sense of hope to that disillusioned support base. Felix Seijas, a Caracas-based political analyst, said that the outcome on Wednesday would show whether the opposition was able to “generate enough pressure” to escalate its bid to unseat Maduro.